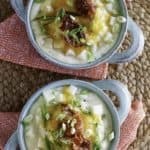 This take on Houlihan's potato soup recipe makes a wonderful, pleasing, and filling meal that your family will eagerly spoon up. Serve with a sandwich for lunch or with crusty bread and a salad for dinner. It’s easy to make. Preheat oven to 400. Prick washed potatoes & bake until a fork pierces to the center easily. Remove potatoes from oven & allow to fully cool. Remove skin & cut potatoes into 1/2" cubes. Set aside. Melt the butter in a large saucepan. Add the onions and sauté over low heat for about 10 minutes or until onions become translucent. Don't let the onions burn. Add flour and simmer 4-5 minutes stirring continuously until the flour is thoroughly absorbed. In a bowl, combine chicken base, water, potato flakes, and seasonings. Stir or whisk thoroughly to get rid of lumps. Add gradually to onion mixture, constantly stirring so no lumps form. Increase to medium heat and continue cooking until the soup begins to simmer gently. Stir or whisk thoroughly to eliminate lumps. Add slowly to onion mixture, stirring constantly so no lumps form. Increase to medium heat & continue cooking until the soup begins to gently simmer. Add milk and cream, stirring until smooth and slightly thickened. Simmer lightly for 15 minutes – DO NOT BOIL. 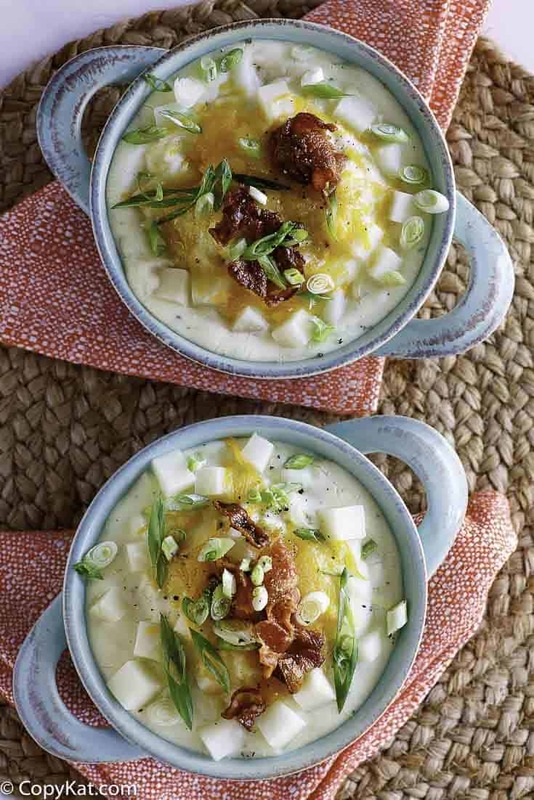 Top each serving with grated Cheddar cheese, sliced scallions & bacon pieces. Substitute two of the 5 cups of water for 2 cups chicken broth for more flavor. Choose flavored instant potato flakes for a different depth of flavor. For a spicier soup, double the spice contents.